WEST SENECA, N.Y. (AP) — In an elementary school hallway, a teacher takes her second-graders to the library, leading a single-file line of giggling boys and girls that's perfectly ordinary until you get to a sleek white robot with a video screen showing the face of a smiling, chubby-cheeked boy. Devon Carrow's life-threatening allergies don't allow him to go to school. 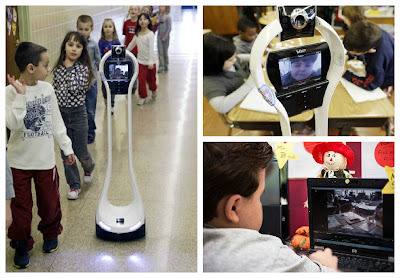 But the 4-foot-tall robot with a wireless video hookup gives him the school experience remotely, allowing him to participate in class, stroll through the hallways, hang out at recess and even take to the auditorium stage when there's a show. What's most remarkable is how unremarkable this gee-whiz technology is viewed by his classmates. In a class of 7-year-olds raised on video games, avatars and remote-controlled toys, they don't see a robot. They just see Devon. See more images of Devon and VGo here. Just before class one recent day, a girl leaned toward the robot to tell Devon the joke making the rounds at Winchester Elementary School: Why did the boy eat his homework? The teacher told him it was a piece of cake. That Devon isn't actually there is barely acknowledged. While making get-well cards for him during a hospital stay last year, his classmates all drew him as a boy, not a bot. "In the classroom, the kids are like, 'Devon, come over, we're doing Legos. Show us your Legos,'" says teacher Dawn Voelker. "I wondered how the little kids would take to him, thinking they'd be amazed," adds Principal Kathleen Brachmann. "But I think kids are so tech-savvy now that they accept it more than we do." Even Devon doesn't quite get what all the fuss is about. Steering the four-wheeled robot through school and spinning around to see the classmates is just another mouse-and-keyboard challenge. "It's so cool because it's like playing a game on the computer," says the boy with a mop of curly brown hair who always seems to be smiling. "It's like your objective is to just survive." For a year now, Devon has attended school using "VGo," a robot shaped a little like a chess pawn and best known for its appearance in a Verizon television ad showing the kind of technology possible using the company's wireless network. Since it was introduced in 2011 by Nashua, N.H.-based VGo Communications, a couple dozen students across the country have used it, including in New Jersey, Colorado, Wisconsin, Texas and Iowa. Click here to meet some of the other children with special health needs using VGo today. For Devon, it was a chance to go to school, albeit remotely, for the first time in his life. He has eosinophilic esophagitis, caused by an allergic white blood cell that grows in his stomach and esophagus. He's also got anaphylactic shock syndrome, which causes life-threatening allergic reactions to triggers including milk and peanuts. Even though attacks have put him in the intensive care unit twice in the past 18 months, Devon is outgoing and energetic, a jokester whose personality better suits him to the school experience rather than home-schooling. But after teachers at Devon's previous school in the Buffalo suburb of West Seneca resisted the idea of having the VGo's camera in the classroom, his mother persisted, and Devon was welcomed at the district's Winchester Elementary. It was added to Devon's special education plan, and the cost — about $6,000 for the robot and $100 in monthly service fees — is being paid out of the district's budget. "We looked at it as a great opportunity," Winchester Principal Brachmann says. "Where I think some people would have looked at what are the challenges, what are the problems, we never even had those conversations. It was just, how can we make this work?" The technology broadens Devon's school experience beyond what would be possible through a video chat. The only restrictions are physical. The robot senses stairs and stops, but even they aren't insurmountable because, at 18 pounds, the robot is light enough for a teacher to lift. Before moving forward, Devon scans the camera downward to make sure he won't run into a classmate who might be crouching to tie a shoe. The VGo warns of large objects ahead. "Walking down a hallway, seeing other kids," Brachmann said. "You couldn't expose somebody on a Skype session that way. It would just be like a TV screen. With this he really gets a feel, a sensation, of being there." On a recent weekday, Devon positioned himself in front of his home computer's camera in a sunroom-turned-classroom in his Orchard Park home and dialed in to Mrs. Voelker's room for the 9:10 a.m. start of school. He controls the VGo alongside teacher Sheri Voss, who comes to his house daily to help navigate and keep him on task. When class was called to order, Devon stood at attention in front of his computer camera, holding a salute to his forehead as the class recited the Pledge of Allegiance. "We don't treat him any differently," Voelker said. "He still has to turn in his homework. He still has to have his mother sign notebooks. He still has a job in this classroom — he's the greeter. "And he still has to pay attention — although there's times I look and he's off, the cat's coming in the room." He's heard through the VGo's speakers. Voelker wears a microphone that amplifies the teacher's voice, which helps all of the students, including Devon, hear her. Instead of raising his hand in class, Devon activates a light on the VGo. Classmate Daisy Cook said it was a bit awkward at first when the technology would glitch, and it didn't quite seem fair that Devon got to stay home and go to school. "But now it's kind of cool," she said, her blue eyes widening, "because we can communicate together. It's like he was never on the VGo." In addition to education, VGo is also attracting attention in the medical and business worlds, allowing doctors to consult with patients and workers to virtually pop into the office, even while traveling.